Genealogist & 1st President of the Prince Edward County Hist. Soc. While researching the Whites of the Quinte area a few incomplete records were found mentioning William White and Hannah Tompkins as the parents of Cornelius White of Hallowell Tp. We did not know the source. Mention of this was posted to this web site and out of the blue, Carol Collins came forward with the original material done by her great grandfather John Stevenson Barker [JSB]. This page is to honour the life and work of JSB who worked out a lengthy genealogy of the Barker family in Prince Edward County. See also the companion web page called: The Barker Family. The material on both of these pages comes from Carol and we thank her immensely for giving permission to share JSB's notes and ephemera. 1. INTRODUCTION: by Carol Irene Haney Collins, Great Falls, Montana, U.S.A.
John Stevenson Barker (referred to as JSB from this point on) was my great-grandfather. He lived and died in Picton, Ontario, Canada, becoming the first president of Prince Edward County Historical Society, in 1899. His only son (out of five children) was Joseph Aishton Barker, my grandfather. 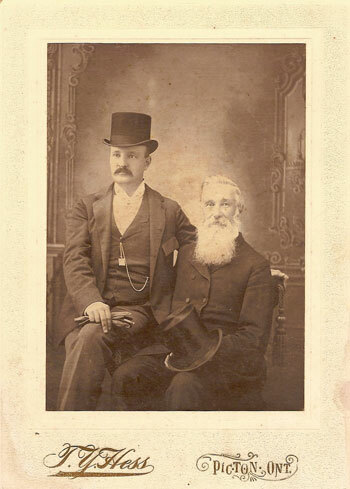 Joseph A. Barker and his father John Stevenson Barker. At some point in the final years of the 19th century, Joseph left Picton to travel to the northwestern part of the United States. He ended up settling in the small, rugged community of Dupuyer, in what became, in 1889, the state of Montana, whose northern border lies adjacent to western Canada. At some point he met and married my grandmother, Louisa Overman, whose family had emigrated from Germany in 1874 and settled on a farm in Minnesota. Louisa had travelled to Dupuyer (in 1890) and, although I don’t know any details of when or where my grandparents met, I know that they were married on July 4, 1892, in Great Falls, Montana, before returning to Dupuyer to live for about four years before returning to Great Falls. I never met either my grandfather or my great-grandfather, but because of JSB’s commitment to recording family history, I feel close to both these men and hundreds of other Barker ancestors as well. My mother, Ethel Emma Barker Haney, born in the family home in 1907 and the youngest of four daughters, remained in the Barker family home until she was 90. She went on to live elsewhere, to the age of 93. I have inherited the extensive family records JSB had himself inherited, and added onto -- records which date back to 1200 AD in England. 2. IMAGES of JSB's notes and ephemera as found in the Family Bible and elsewhere. Thomas Aishton & Sarah Amelia Fairfield, 1835? The account below was found by Jon Acker in 2009 and emailed to R. Saylor who scanned the text as below. No on line version has been found for Volume 12. Source: American Ancestry: giving the Name and Descent, in the male line, of Americans whose ancestors settled in the United States previous to the Declaration of Independence, V 12, Thomas Patrick Hughes, Frank Munsell, 1899, Pub. Joel Munsell’s Sons. BARKER, JOHN STEVENSON of Picton Ont, Canada, b. in Bloomfield co. P. Edward Onto Can. July 8, 1832, was brought up to mercantile business by his cousin David Barker Stevenson J. P. and M. P. P. for co. Prince Edward Can., owing to feeble health he entered into no permanent business but became an entertainer of friends and a helper in word and deed to those about him, was first pres. of Co. P. Edward Hist. soc. instituted 1899 (m. Oct. 28, 1857 Elizabeth Emma Aishton, b. Oct. 4, 1836, eldest child of Dr. Aishton b. Sep. 21, 1808 and bapt. Oct. 2, 1808 in parish of Stoke Damerel Eng. m. Dec. 16, 1835 Sarah Aurelia Fairfield, and gr. dau. of Thomas and Elizabeth Aishton, she had 5 ch. viz. : Harriet Barker b. Oct. 2, 1858, Mary b. Sep 26, 1860, Joseph Aishton Barker b. July 4, 1866, Lillian Emma May Barker b. Nov. 4, 1872, d. June 2, 1890 and Lenore Ira b. Oct. 20, 1879); son of Joseph of Bloomfield Ont. Can., b. near Poughkeepsie N. Y., July 10, 1804, d. in Bloomfield July 16, 1841, buried in Picton Ont., resided with his father in Wellington Can., was with his father in business there, removed to Bloomfield where he erected extensive woolen mills as Barker & Williams making flannels and fine cloths, getting weavers etc. from Lowell Mass. and Eng., did a very extensive business in that as well as farming, had ill health and d. early from over ambition, greatly mourned as a neighbor, leaving 4 small ch., David Barker Stevenson was his acting executor of a thousand acres of land in various parts of Can. for his children (m. May 4, 1831 Harriet White, b. Mar. 3, 1813, d. Feb. 12, 1885, youngest dau. of Cornelius White of Bloomfield Can. [eldest of 3 ch. of William White and Hannah Tompkins, who removed from Rhinebeck N. Y. to first Con. tp. Sidney co. Hastings about 1802 and named their new residence Rhinebeck, afterwards known as Whitesville and Whiteschurch on the bay of Quinte Can.] who m. Elizabeth Acker who had 8 ch., she had 4 ch. viz. : John Stevenson above, Shove b. Nov. 18, 1833, Mary Anne b. June 13, 1835 and Merritt b. July 16, 1837); son of James of Bloomfield Can., b. in R. I., probably Dartmouth, Aug. 10, 1772, d. in Bloomfield Oct. 13, 1847, removed from Dutchess co. N. Y. about 1805 to his father's on Quinte bay, learned milling in Stone Mills, built and ran a saw mill on his father's property High Shore, built a grist and saw mill and did a merchandising business in Wellington 1815-30, removed to Bloomfield 1830, giving its name Bloomfield in the tp. Hallowell, erected a large mansion 1831-32, his son Joseph and John Platt Williams put up on same property [300 acres] a large modern woolen frame factory 1840, here he passed the remainder of his days, retired from active business (m. in Nine Partners N. Y. Mar. 1797 Mary Leavens, dau. of Joseph and Phebe [Stillwell] Leavens of Dutchess co., they had 10 ch. viz. : Jane, Sarah, Mary, Katy, Deborah, Benjamin, Peter, Eliphalet, William and James, gr.-dau. of Peter Leavens b. in Killing Ct. Nov. 17. 1707 who m. by Soc. of Friends in Westchester co. N. Y., Feb. 24. 1745 Catharine Caston b. June 6, 1722. she had 4 ch. viz. : Elizabeth b. July 6, 1798, Hugh Judge b. Apr. 9, 1800, Anna b. June 9, 1802, and Joseph above); son of David of Barker Pt. and Ferry, Adolphustown Can., b. in R. I. July 16, 1732, d. in Barkers Pt. bay of Quinte Jan. 7. 1821, buried in "Friends" meeting house yard Adolphustown, farmer, mem. Soc. of Friends moved from Dartmouth R. 1. to Dutchess co. N. Y. about 1780. 12 miles east of Poughkeepsie. now called the old Barker homestead and Mitchell farm, removed to Bay of Quinte 1784 and settled on what was called Barker's Pt. and Ferry, in the bay dists., he located many of his ch. with ample means at his disposal $17,000 (m. Mar. 11, 1762 Lydia Shove, dau. of Samuel Shove, she had 12 ch. viz. : Samuel Shove Barker b. 1763, d. 1836. Asa b. 1765. d. in Eng. a marine pensioner of battle of Trafalgar, Edward b. 1776, d. 1820, David b.. 1768, d. in Barkersville N. Y. 1856, Phoebe b. 1770, d. in Picton Can. 1830. James above, Elizabeth b. 1774. d. in Sophiasburgh 1848, Sarah h. 1776, Rebecca b. 1779, d. 1853. Abraham b. 1781, d. in Picton 1829. Lydia b. 1782 and Caleb b. 1786, d. in Poughkeepsie Nov. 21. 1852); son of James, b. Jan. 26, 1692, d. 1750 (m. 1715 Elizabeth Tucker, dau. of Abraham and Hannah [Mott] Tucker, David above was her youngest son). "Primary sources for the narrative that follows this Introduction include material I’ve inherited from my mother, including those recorded in JSB’s own handwriting, found in the Barker family Bible and elsewhere. Other records used come from two sources." On page 2 of the above source are the following words, handwritten in red ink: “Presented to My Dear Son Joseph Aishton Barker – by his father John Stevenson Barker . . . Picton, Ont. Can. March 1899.” A red line descends vertically from the number “1” followed by the name, “Randulph de Calverhall,” with “Our line Royal,” written to the left, extending to include the number “19” on the next page, in reference to the number of generations. Information enclosed in quotation marks was taken from a book written by Thomas Patrick Hughes and Frank Munsell, Volume 12, published in 1899 by Joel Munsell’s Sons. This book includes historical facts of the male line of Americans whose ancestors settled in the United States previous to the Declaration of Independence. I am grateful to all my ancestors for their unique DNA, both male and female, but especially to JSB!